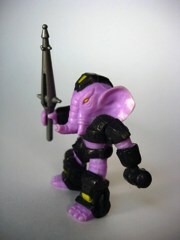 Oh, Battle Beasts are fun. 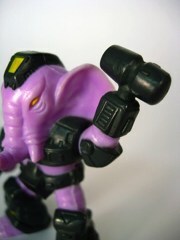 The Sledgehammer Elephant was one I know I asked for as a kid because, well, elephant. It's awesome. As a kid, an elephant is about as close as you can get to a dinosaur in terms of large, land-dwelling creatures that can mess stuff up. As with many of the other figures I review here, this is the one I had as a kid. It's also one of very few figures who lost his weapon (which I'm convinced is here in a box somewhere) so I bought this off another collector in early 2012. The figure, as they all do, have some sort of symbol hidden in a black symbol on their armor. What makes this one particularly funny? A) it's on his crotch, and B) it's wood. If that isn't delightful to you, I weep for your soul. 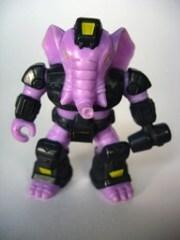 One of the things I really loved about Battle Beasts were the odd colors they selected. 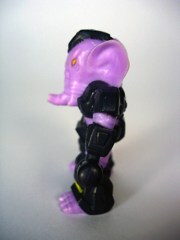 Rather than paint him grey with white tusks, we got a purple one. Why purple? I'd love to know! Takara's 1980s toys came in some delightfully goofy colors, and they got progressively weirder through the 1980s. 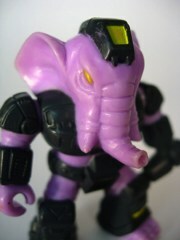 (Also worth noting: Transformers Pretenders.) So he's molded in purple, with painted dark grey armor and some yellow highlights-- note his eyes, helmet, and shins. There's not a lot to it in this color department, but it seems just fine to me. 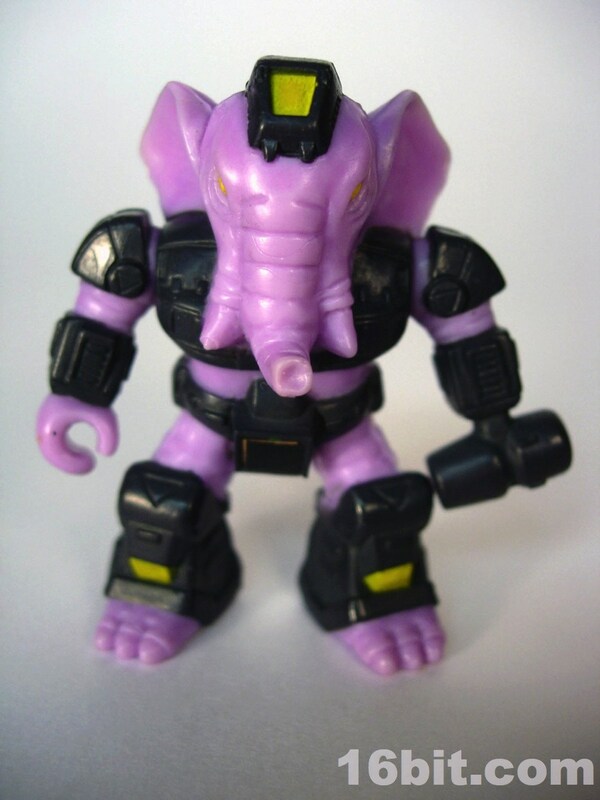 I'm sure if you handed it to a typical kid today, they'd be thrown by the odd purple color (like I was) to probably not even question the unpainted tusks until they, too, were faced with the idea of judging it on an aesthetic level 25 years later. As with the rest of the line, Sledgehammer Elephant has two joints. 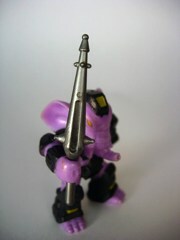 What's particularly interesting, though, are all the little details in his sculpt. Covered in rectangles, triangles, and tiny vents for no readily apparent reason, it seems that Takara could've cranked out reissues of these with new paint jobs, and they would be quite impressive. To give the figure a greater sense of age, they even sculpted some lines under his eyes. 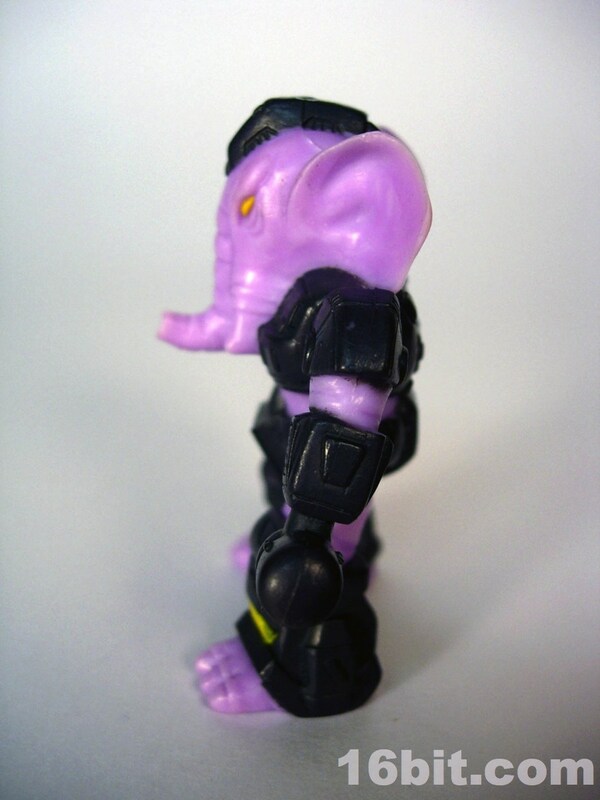 The ears have a little bit of detail, and the feet don't look particularly elephant-like. The legs are a little knobby, as are the arms, so what you have here is a pretty slick little figure. Like a few of the figures, the name is descriptive of a feature on his person. 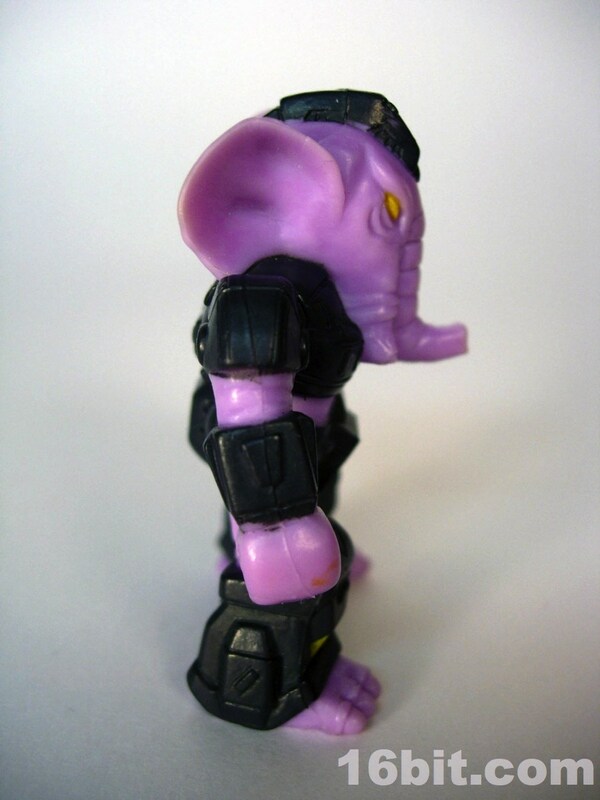 His left hand is a giant hammer, so "Sledgehammer Elephant" makes a lot of sense as far as names go. It also calls attention to a handicap, it'd be like calling someone with one leg "Stumpy" or something. 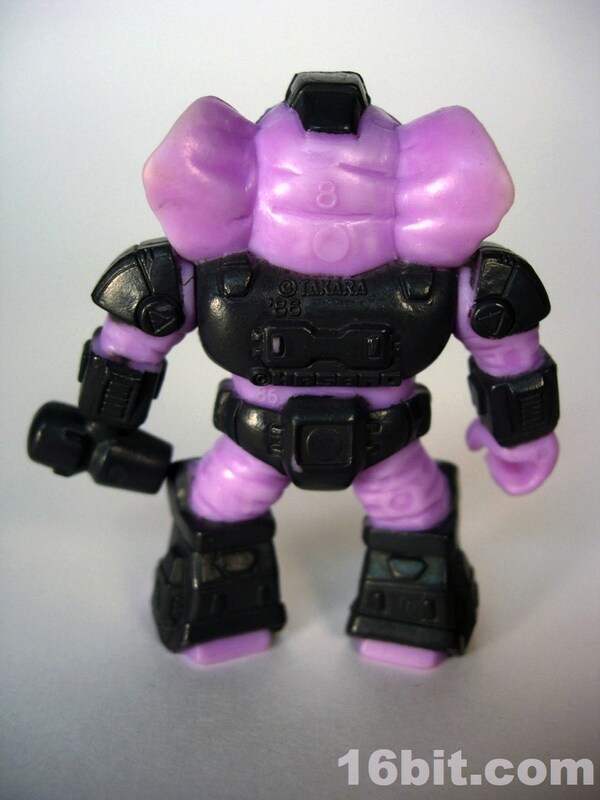 As a kid I always preferred hands to weaponized hands, except on this guy. I liked hitting other figures with his hammer, and if they ever made a giant version of him with a spring-loaded arm I'd totally buy it. It's just so dang much fun to have a built-in hammer fist, which as of yet neither new beast line seems to have. Although I guess with the Minimates, it'd be really easy to replicate by grabbing a few of the other figures and swapping parts. Hooray, customization! A new elephant figure is coming this year in Takaratomy's Beast Saga line, and the reason I'm so excited to get it is because Sledgehammer Elephant was such a delightful plaything when I was a kid. So to me, it's priceless and unquestionably worth owning-- but on eBay, it's closer to $20 complete. If you're looking to save a few bucks, just the weapon alone sells for $1 or $2, and the figure often sells for about the same. Does that make any sense to you? It doesn't make sense to me.